Answer: No, it was an IFO (Identified Flying Object). I’m pretty sure what you saw was a very young Crescent Moon. When I entered the date from your email, and your location, my astronomy app recreated what you saw. It probably looked much like the photo above, which I captured earlier this year. That’s a very young Moon … my astronomy app tells me about 22.5 hours old. For comparison, this image, shot in 2012, shows a Moon about 3 days old. When the Moon reaches its “New” phase it has essentially zero thickness. You can’t see it without special equipment (see Legault’s link below). From there it begins to wax (become increasingly more illuminated). You can see the entire lunar phase cycle in this NASA time-lapse from my 12 Nov 2012 post. Of course, being a nearly spherical body, the Moon is always half illuminated and half dark — our changing perspective as it orbits Earth creates the phases we see. For the photo above, I was using a Zuiko 200 mm lens on my Canon EOS 20D. For all you photographers out there, here’s the EXIF data: aperture = f/16, Δt = 1/10 second, ISO = 800. 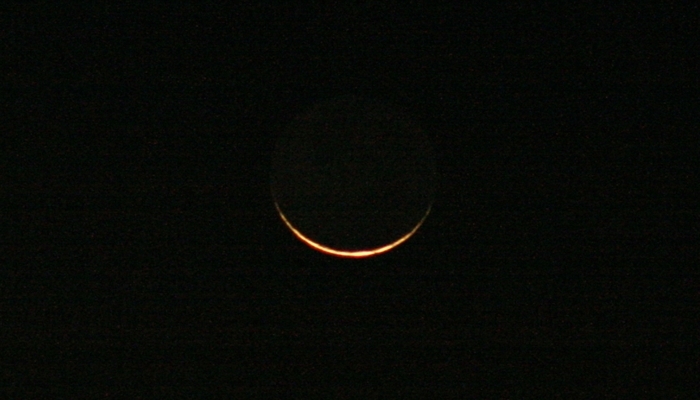 That pretty much wiped out the earthshine and allowed me to better estimate the arc of the crescent. Looks like about 90° to me, so this is my youngest Moon photo to date. I don’t spend a lot of time shooting young Moon photos. Others with more advanced technology have done far better. For example, see this amazing photo. Then take a look at the essentially unbeatable “world record” by Thierry Legault here. To catch these young Moons you have to be outside just after the sunset following a New Moon. You can easily find the times and dates for New Moons online. Binoculars will help you spot the thin crescent, but you don’t really need them. Just scan the sky above the horizon where the Sun set, and you might catch your own very young Moon. If not, try again the next night, when the crescent will be slightly thicker and higher in the sky.